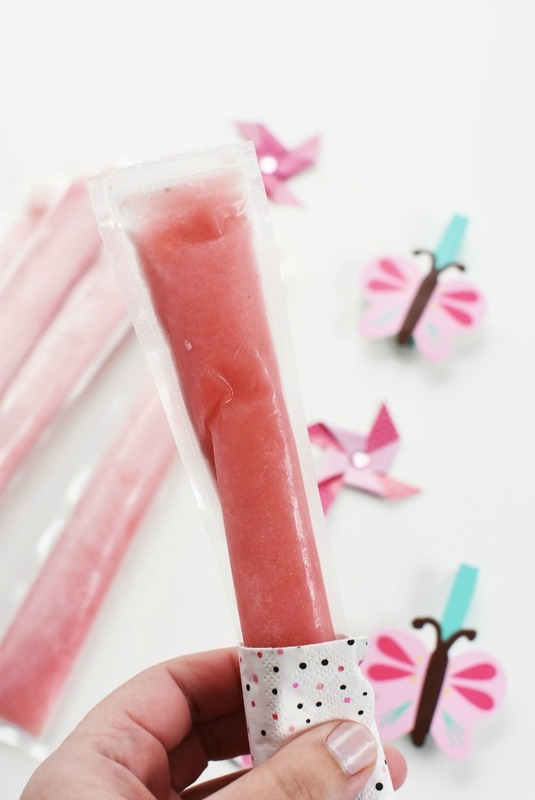 Are you searching for a no sugar added, homemade tasty frozen treat in a convenient freeze pop style package? These Homemade Frozen Yogurt and Fruit Pops are made with Juicy Juice 100% fruit juice, vanilla yogurt, and fresh strawberries. 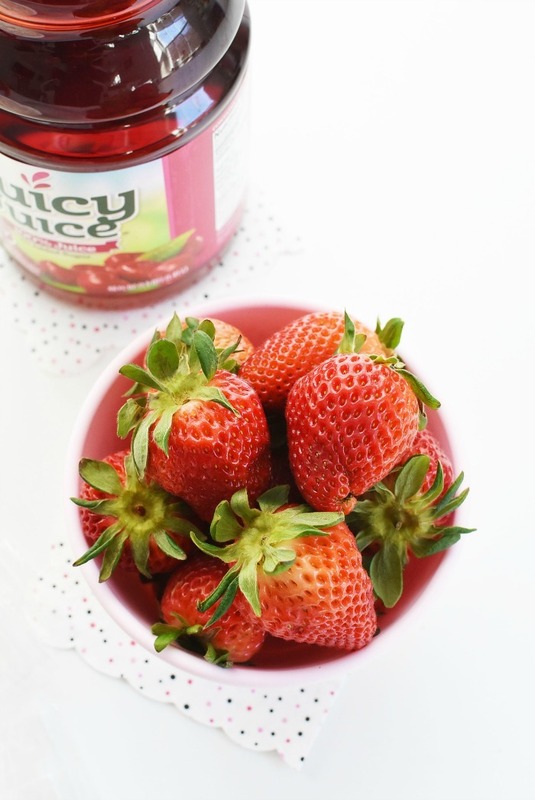 This post is sponsored by Juicy Juice 100% Fruit Juice. Kids can be picky eaters! I know, I know, that’s the understatement of the century, right?! 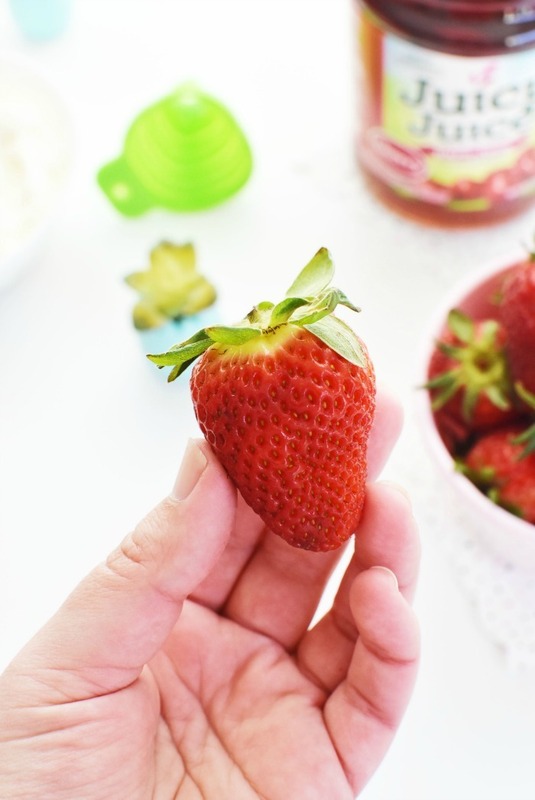 It’s always a challenge coming up with fun new snacks all three of my kids will enjoy! But, I think I finally found one concoction that with help us survive spring break which is soon! Are you kids crazy for freeze pops also known as ice pops? My kids are and they could probably eat one pack a day! 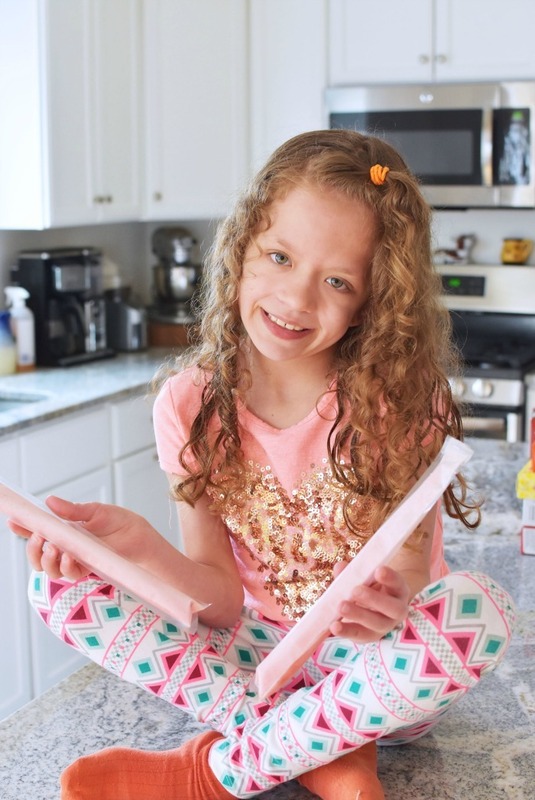 But, as a parent who tries to sneak in as much nutrition as possible into their days I wasn’t feeling the artificial dyes, and preservatives in most store-bought brands. To help address the issue of having very few wholesome options available, I decided to buy a bulk pack of yogurt or freeze pop tubes from Amazon and make my own frozen tube treats. Check out EVERYTHING you need to know on making these below! 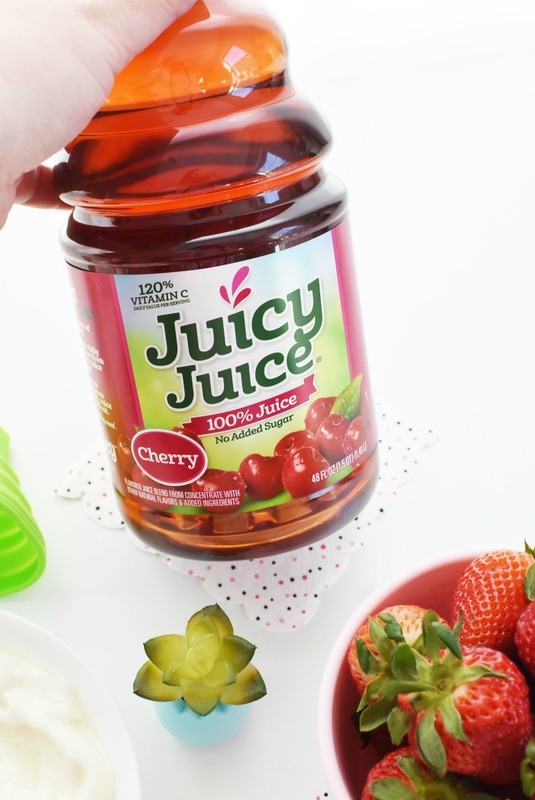 We used Juicy Juice to add the flavor and our concoction worked out deliciously! 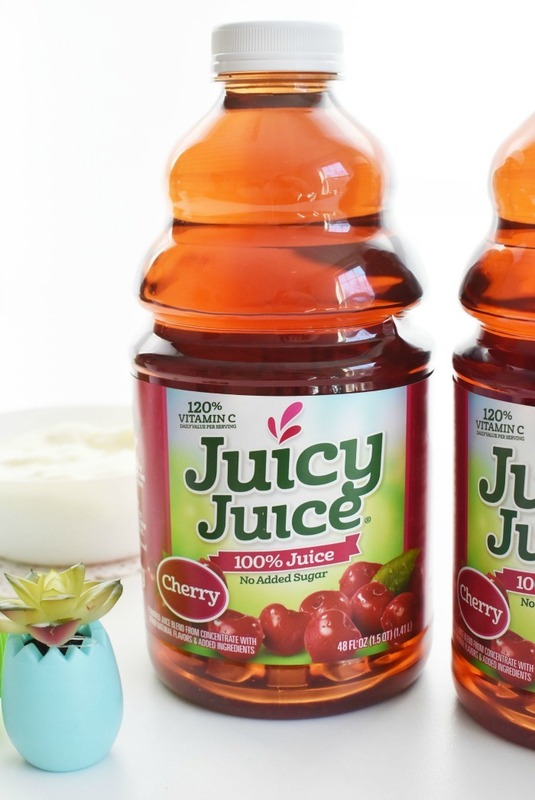 Jared and I love serving up Juicy Juice 100% Juice to our 3 kiddos. It contains nothing artificial and is made of fruit juice without the fillers, or unnecessary chemicals. My kids have been enjoying this brand since babies and I feel better knowing they are getting nutrients when they consume it. We made the switch to this brand over 10 years ago and have been serving it ever since! 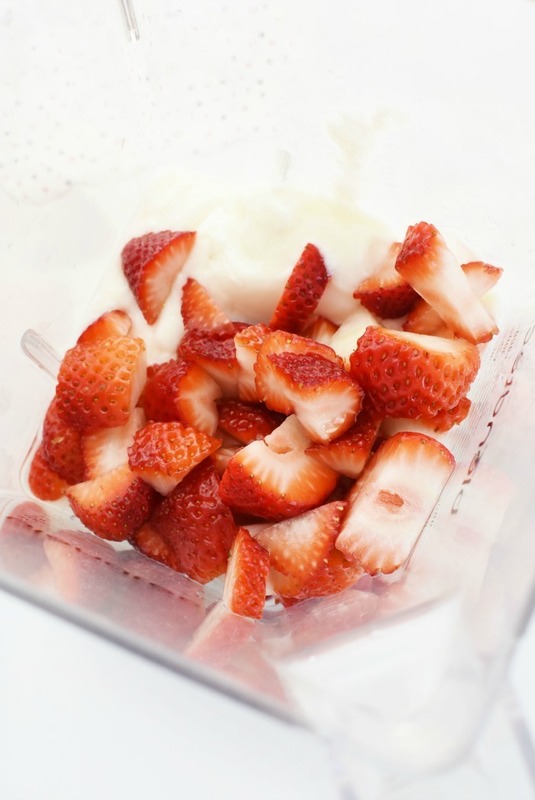 For this recipe we opted for a conventional low-fat vanilla yogurt. We didn’t want a creamy, thick Greek variety because we wanted the mixture to be thinner and sweeter. This is one recipe where Greek yogurt didn’t work well. We purchased ours on Amazon and got 250 in our bag. These were pretty easy to work with once I got the hang of opening and filling them. I suggest filling these over a mixing bowl to capture any spills because there will be some until you get the hang of it. Our tubes came with a rubber funnel, but next time I will use my hard plastic one for ease of use! I found the rubber one to be a bit flimsy. How long for ice pops to freeze? 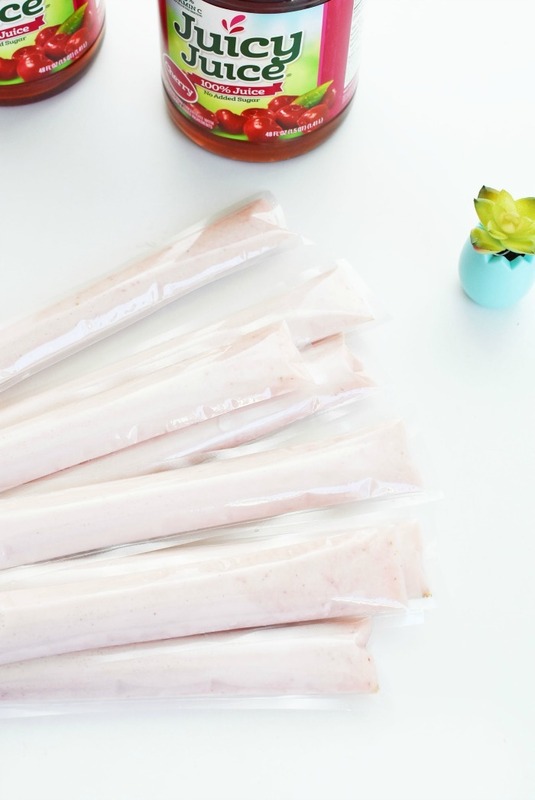 These Homemade Frozen Yogurt Fruit Freeze Pops took 4 hours to fully freeze. Of course this is dependant on your freezer’s make/model/capacity but count on at least 4 hours of freeze time. 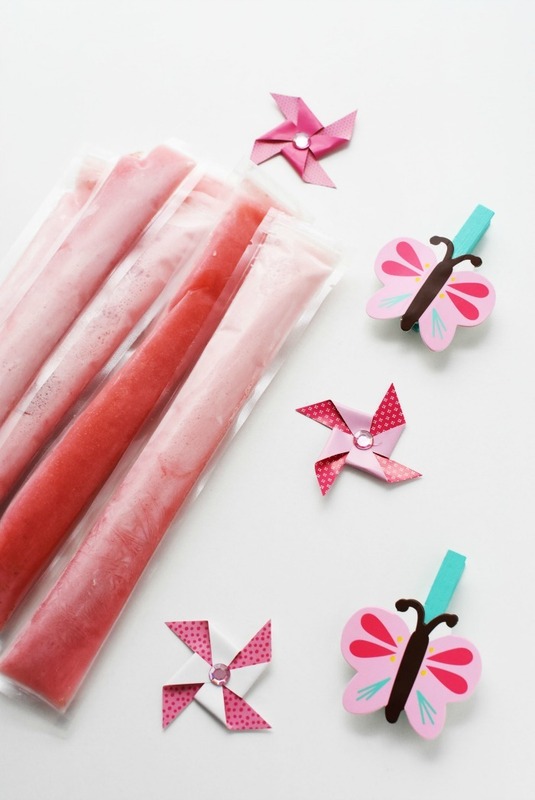 Our kids love the taste of these pops and thought they were the perfect balance of yogurt and ice treat! I will be making them regularly with different berry add-ins. 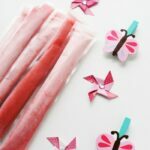 Are you searching for a no sugar added, homemade tasty frozen treat in a convenient freeze pop style package? These Homemade Frozen Yogurt and Fruit Pops are made with Juicy Juice 100% fruit juice, vanilla yogurt, and fresh strawberries. 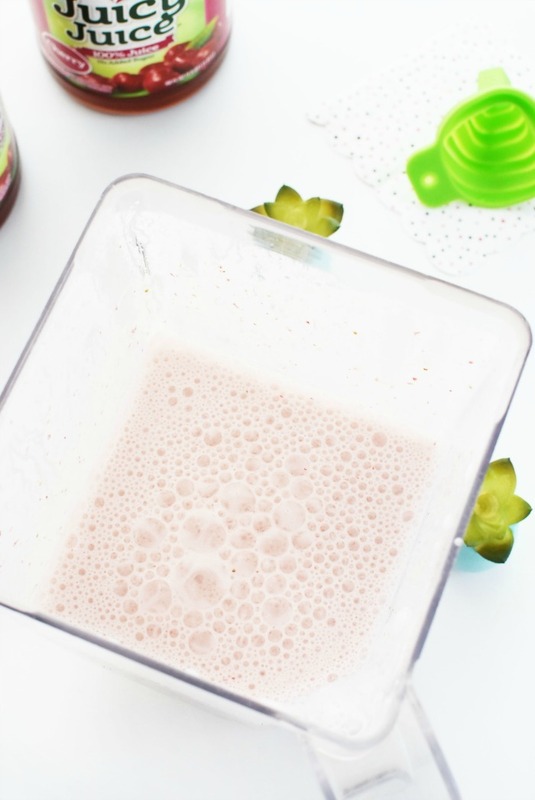 Add berries, yogurt, and juicy to a blender. 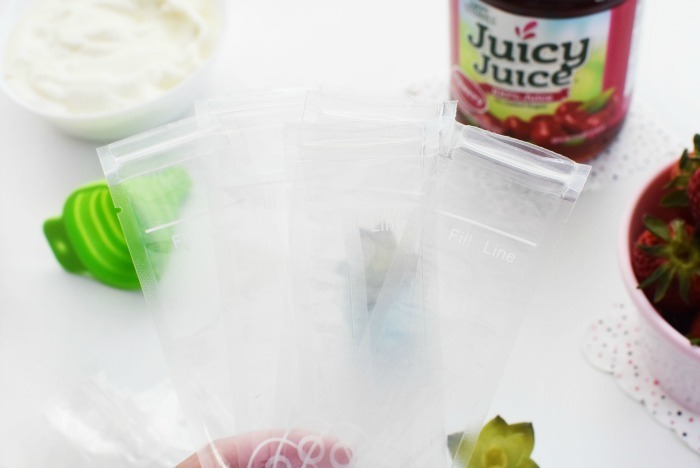 Using a funnel, fill each tube with product until you reach the fill line. Once all tubes are filled, place them in the freezer for 4 hours. These pops are messy to fill. I suggest filling them over a bowl to capture excess liquid. They take 4 hours to freeze so keep that in mind when preparing. This is genius! I am fortunate our kids aren’t majorly picky, so these will go over well with them. Perfect for hot summer days. Oh these would be great to make during the summer. Especially poolside! A must to make for my kids this summer! Those sound really good! I need to make some of these for summer. That is such a fun idea! 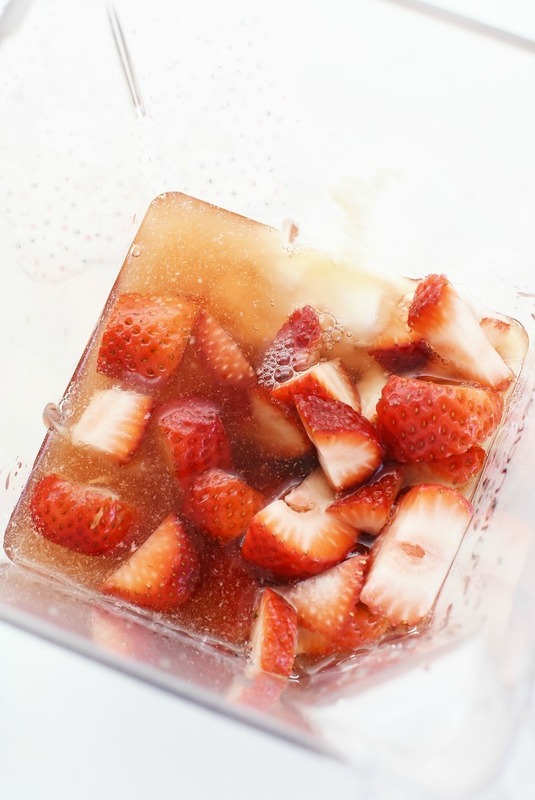 We have a freezer quick popsicle maker and it takes like 30 minutes – pour in the juice and it’s ready! I’m going to try your recipe in my maker! I wouldn’t have thought of adding the juice to thin it out. That is a great addition. It’s summer here and so hot! This is perfect for today’s weather. My niece would love this. This would be so great and kids are will love this for sure and a perfect recipe for preparing together with your kids such a great bonding time together. These sound really good. I love homemade treats.